Each month, we like to take an in-depth look at one of our top products to help customers find the perfect product for their needs. This month, we’re shining our spotlight on one of our favorite new products, the Quad USB Charger from Pass & Seymour. Almost everything that needs charging these days uses a USB cord, from iPads to phones to game controllers, and this USB wall outlet cuts out the need for a USB to DC converter. 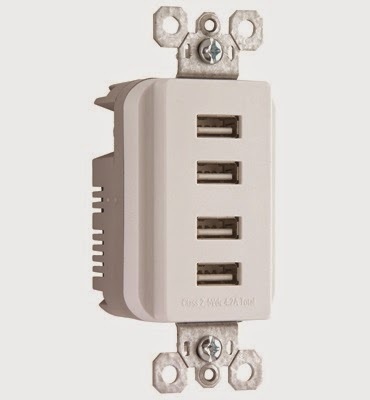 With its slim 1.3” design, the USB charger outlet can fit into any standard electrical box. Installation is fast and easy with the charger’s screw-pressure plate back wiring, so you don’t even have to worry about hiring an electrician to add this handy charger to your home or business. Boasting four 5-volt DC USB ports, this charger is compatible with devices that use USB 2.0 and 3.0, so most USB devices can use this without any worries of non-compatibility. This wall outlet lets you charge four USB devices at a time, so you don’t have to spend time looking for an open outlet. At only $30, this USB outlet wall plate is a fantastic deal. Whether you’re looking to outfit your home with an easy way to charge all of your devices or provide customers with a simple place to charge up, this USB outlet is an excellent option.